Becoming a licensed certified public accountant requires successfully completing multiple steps. The formal requirements to sit for the CPA exam and to ultimately become a licensed CPA are governed by the individual State Boards of Accountancy in the jurisdiction that you plan to practice. While the specific steps are similar across the country, each individual state may have small differences or extra requirements necessary. 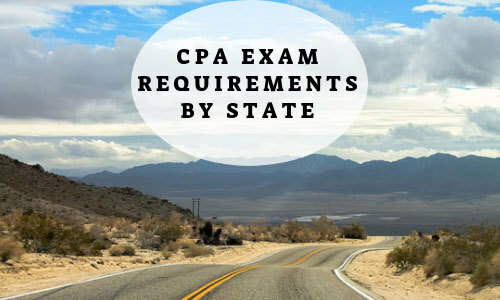 This article is designed to be a comprehensive reference for you that outlines the requirements and considerations you need to be aware of to become a licensed CPA in your state. Bachelor's Degree from a US accredited institution with 150 credit hours of accounting. Meeting the 150 credit hour requirement may require a 5th year of school to meet the credit requirements. For example, Villanova University's accounting program offers multiple options to meet the 150 credit hour requirement that range from 4 years to 5 years. With Villanova's program, students will earn both an undergraduate accounting degree and a Masters of Science in Accounting. The Uniform Certified Public Accounting Exam is developed by the AICPA and administered at individual Prometric testing centers. Select a US jurisdiction that you plan to practice in and apply with the Board of Accountancy in that jurisdiction to sit for the exam. After meeting the Education requirements and registering for the exam, you have an 18 month testing window to complete all 4 sections of the exam. The CPA includes 4 sections: Auditing and Attestation (AUD), Business Environment and Concepts (BEC), Financial Accounting and Reporting (FAR), and Regulation (REG). Each section requires a minimum score of 75 or higher to pass. The exam is a computer based and the entire test takes 16 hours to complete (4 hours for each section). You may take as many sections in a given test window as you prefer, but you must pass all 4 sections of the exam within 18 months. The 18 month clock starts as soon as you pass your first section. Most jurisdictions require at least 2 years of public accounting experience where you are working directly under a licensed CPA; however other states with more flexibility can require as little as 1 year of related accounting experience (instead of a more strict definition of public accounting experience). Non public accounting experience is typically acceptable, however some jurisdictions require increased years of experience to meet the requirements. Some jurisdictions may require an additional ethics exam before you may be eligible. Most states that have this requirement use the AICPA ethics test, however some states have a state specific ethics test. Consult your individual jurisdiction below to see if that requirement applies to you. Apply directly to your jurisdiction to become licensed. Meet the Continuing Professional Education credit requirements. Most jurisdictions require 40 credit hours per year. The main difference is whether you need to verify your CPE credits every year or every 2 or 3 years. If the jurisdiction allows for every 2 years or every 3 years, the CPE requirement typically increases by an additional 40 credit hours per year (80 credit hours for 2 years and 120 credit hours for 3 years). Acceptable program types and curriculum vary by jurisdiction. Renew your CPA license based on your jurisdiction requirements (ranges from annual renewals to once every 3 years). Some jurisdictions allow students to sit for the CPA exam outside of the US. This means that an international student can sit for the CPA exam and must meet the same requirements set by a particular State Board of Accountancy. International students must still first register with the appropriate jurisdiction they plan to practice and meet the same requirements of other students in that state. Candidates in one tier jurisdictions are required to pass both the CPA exam and meet the work experience requirements before earning a certificate and a CPA license. Candidates in two tier jurisdictions will earn a certificate upon passing the Uniform CPA exam. After meeting the work experience requirements, you are then eligible to earn the CPA license to practice. There are a total of 55 US Boards of Accountancy. This includes all 50 states, the District of Columbia, the US Virgin Islands, the Commonwealth of Northern Mariana Islands, Puerto Rico, and Guam. We recommend that you follow the requirements for the jurisdiction that you plan to start your accounting career. However it is possible to transfer CPA exam scores to any state for the purpose of obtaining a CPA license. Graduate degree from an accounting program accredited by the AACSB. Graduate degree from a business program accredited by the AACSB that included the same credit hours listed in requirement #1. For more information about specific requirements in Alabama, see the official Alabama State Board of Accountancy website here. Education to sit for CPA Exam: earned BA or within 18 credits of completing BA. For more information see the official Alaska State Board of Accountancy website here. For more information see the official Arizona State Board of Accountancy website here. 30 credit hours in Accounting or 20 credit hours in an Accounting graduate program. For more information see the official Arkansas State Board of Accountancy website here. 24 credit hours in Accounting, 24 credit hours in business related programs, 6 credit hours in accounting study, and 10 credit hours of Ethics. For more information see the official California State Board of Accountancy website here. 27 credit hours in upper division Accounting. 6 credit hours must be in Auditing & 3 credit hours must cover Generally Accepted Auditing Standards. 3 credit hours of Accounting ethics. For more information see the official Colorado State Board of Accountancy website here. 27 credit hours in Accounting. For more information see the official Connecticut State Board of Accountancy website here. 24 credit hours in Accounting. For more information see the official Delaware State Board of Accountancy website here. 24 credit hours in Accounting and 3 credit hours in commercial law. For more information see the official District of Columbia State Board of Accountancy website here. 30 credit hours in Accounting, taxation, auditing, and financial & cost accounting. For more information see the official Florida State Board of Accountancy website here. 30 credit hours in Accounting. For more information see the official Georgia State Board of Accountancy website here. For more information see the official Guam State Board of Accountancy website here. For more information see the official Hawaii State Board of Accountancy website here. For more information see the official Idaho State Board of Accountancy website here. Option 1: Accounting Graduate degree from AACSB accredited school. Option 2: Graduate degree in business from AACSB / ACBSP accredited school. Minimum 30 semester credits in accounting; at least 1 course in financial accounting, auditing, taxation, and managerial accounting. 2 credit hours in Research & Analysis in Accounting. Option 3: Bachelor or Graduate degree from accredited school. 30 semester credit hours in accounting; 24 credit hours in business; 2 credit hours in Research & Analysis in Accounting, 2 credit hours in Business Communications, and 3 credit hours in Business Ethics. For more information see the official Illinois State Board of Accountancy website here. 24 semester credit hours in undergraduate accounting or 15 semester credit hours in graduate accounting. For more information see the official Indiana State Board of Accountancy website here. 1 year of attest experience under a CPA. 24 semester credit hours in accounting that is above the basic course levels. For more information see the official Iowa State Board of Accountancy website here. 30 semester credit hours in accounting. For more information see the official Kansas State Board of Accountancy website here. 27 semester credit hours in accounting. For more information see the official Kentucky State Board of Accountancy website here. 24 semester credit hours in accounting. For more information see the official Louisiana State Board of Accountancy website here. 15 semester credit hours in accounting. For more information see the official Maine State Board of Accountancy website here. 51 semester credit hours in accounting and related subjects with a degree that includes a major in accounting or completed classes that would be equivalent to a major in accounting. For more information see the official Maryland State Board of Accountancy website here. 1 to 3 years of public accounting experience equivalent to 2,000 hours. 18 credit hours from a graduate program or 30 undergraduate credit hours in accounting. For more information see the official Massachusetts State Board of Accountancy website here. 1 year of general industry experience. 30 credit hours from an undergraduate program or 12 graduate credit hours in accounting. For more information see the official Michigan State Board of Accountancy website here. Graduate degree with 24 credit hours in accounting at either undergraduate or graduate level. For more information see the official Minnesota State Board of Accountancy website here. 24 semester credit hours in graduate accounting. For more information see the official Mississippi State Board of Accountancy website here. For more information see the official Montana State Board of Accountancy website here. 3 years of auditing experience in Dept. of Revenue or Office of the Auditor. For more information see the official Nebraska State Board of Accountancy website here. 4 years of internal audit or government accounting. For more information see the official Nevada State Board of Accountancy website here. 1 year of public accounting or government agencies. For more information see the official New Hampshire State Board of Accountancy website here. 1 year of public accounting. For more information see the official New Jersey State Board of Accountancy website here. 1 year of related accounting experience. For more information see the official New Mexico State Board of Accountancy website here. 1 year of public accounting or related accounting experience. Masters degree in accounting from an AACSB accredited accounting program. For more information see the official New York State Board of Accountancy website here. 4 years of accounting experience including teaching experience. 20 semester credit hours graduate accounting. For more information see the official North Carolina State Board of Accountancy website here. 24 semester credit hours of accounting. For more information see the official North Dakota State Board of Accountancy website here. 2 years of public accounting experience including in industry, government or academic. For more information see the official Northern Mariana Island Board of Accountancy website here. 1 year of public accounting experience that includes at least 150 hours. 30 semester credit hours of accounting. For more information see the official Ohio State Board of Accountancy website here. 1 year of public accounting experience. For more information see the official Oklahoma State Board of Accountancy website here. For more information see the official Oregon State Board of Accountancy website here. For more information see the official Pennsylvania State Board of Accountancy website here. 58 semester credit hours of accounting. For more information see the official Puerto Rico Board of Accountancy website here. 1 year of accounting related experience. For more information see the official Rhode Island State Board of Accountancy website here. 1 year of accounting related experience with 2,000 hours. 36 semester credit hours of accounting. For more information see the official South Carolina State Board of Accountancy website here. For more information see the official South Dakota State Board of Accountancy website here. 2 years for CPA's for attest services. For more information see the official Tennessee State Board of Accountancy website here. For more information see the official Texas State Board of Accountancy website here. 20 semester credit hours of accounting. For more information see the official US Virgin Islands Board of Accountancy website here. Graduate degree: 24 semester credit hours of undergraduate accounting and 15 credit hours of graduate accounting. For more information see the official Utah State Board of Accountancy website here. 1 year of public accounting experience with at least 500 hours of attest and 300 hours of audit. 42 semester credit hours of accounting, audit, and related subjects. For more information see the official Vermont State Board of Accountancy website here. 24 semester credit hours of business courses. For more information see the official Virginia State Board of Accountancy website here. 24 semester credit hours of accounting with at least 15 semester hours in graduate level accounting. For more information see the official Washington State Board of Accountancy website here. 6 semester credit hours accounting, 6 credit hours in auditing, 3 credit hours in tax, 3 credit hours in cost or managerial, and 9 credit hours accounting electives. For more information see the official West Virginia State Board of Accountancy website here. CPE Requirements: will be required starting in 2021. Undergrad degree: 14 semester credit hours of accounting. Graduate degree: 24 semester undergraduate credit hours and 15 semester credit hours of graduate accounting. For more information see the official Wisconsin State Board of Accountancy website here. For more information see the official Wyoming State Board of Accountancy website here.